While kitchen countertops see more of the action when it comes to the grind of every day living, bathroom countertops also see its share of day-to-day use. 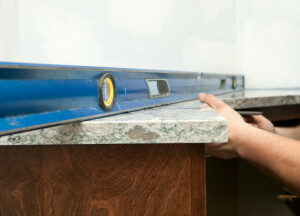 But the two types of countertops endure different kinds of wear and tear. Toothpaste, makeup, hair products, and other can cause different kinds of messes than you see in the kitchen. Like in the kitchen, marble and granite offer a sleek look that can really create a stylish feel in the bathroom. Obviously, that kind of look will cost you a little bit more than the other styles, but the extra pays off in looks as well as resale value. Make sure your granite is properly sealed to deal with the grease left behind by some hair products and other beauty products. This is especially true of marble, which stains easier than marble. Wood countertops are often associated with the kitchen which may drive some homeowners away from the surface. And, considering all the moisture the bathroom creates, if the wood surface isn’t properly cared for, problems can occur. But, if correctly sealed, a wood bathroom countertop can create a warm feeling in the bathroom. Laminate countertops come in a variety of styles and are a cheaper alternative to the more expensive materials. And laminate is very water resistant and easy to clean. However, if the laminate is damaged, the entire countertop may need to be replaced. Bathrooms decorated in tile can make for an attractive, charming, or informal feel. Tile is an affordable option, and if a tile does get damaged, it can be replaced instead of redoing an entire counter. If installed properly, most homeowners can take the task on themselves. However, with tile comes grout and all the necessary steps to keep it looking clean. There are products available to help with the process, but homeowners will need to spend time keeping everything looking neat.